Maples and Sycamores are deciduous trees whose ultimate height can vary from 5 to 20 metres high. They propagate by dropping seeds which fall to the ground in a spinning motion like a helicopter. Maple trees have small clusters of green flowers at the end of each shoots which, once pollinated turn to the characteristic winged fruit. The trees often have lobed leaves with fantastic foliage colour all year round. Maple wood is commonly used for furniture or floorings due to its lovely honey colouring. Maple trees also supply the sap for the making of maple syrup. This sap is harvested in Spring, and boiled up to remove excess water. If planting trees staking is often needed, but it should be no higher than 60cm (2ft) above the ground. Tree Staking Advice. 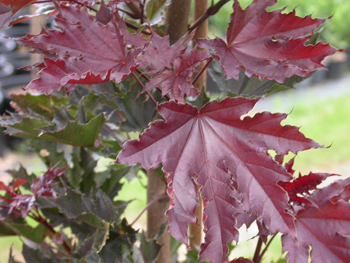 Maple trees are very easy to grow and do not necessarily need to be pruned. You can remove any dying or diseased branches with a saw if they begin to cause an issue or if you wish to maintain the tree at a more manageable size. Maples like to be planted in acidic peaty soils but if you're soil is not of this type just add a dash of Ericaceous Compost. This is a lime-free compost which is specifically designed for acid loving plants.